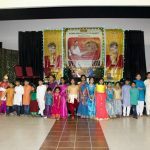 With Lord Sri Hari’s grace and the blessings of Sri Swamiji, the Dallas GOD Utsav was celebrated in a grand manner from 24th to 26th December, 2010,We celebrated Dallas GOD Utsav 2010 in a grand manner. The first day of the GOD Utsav started at Sri Ramji and Smt. 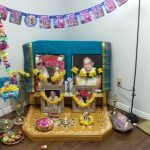 Vidyaji’s residence in Frisco TX on Friday. Dec 24th evening. Mahamantra Kirtan, followed by Dhyana Slokas, Bhishma Stuti were recited and Sri Sri Swamiji’s Kirtans were sung. Smt. Uma Meyyappan of the satsang conducted a Ramayana Quiz. The event concluded with ‘Kaliyayum Bali Kollum’ and Dolotsav. The second day of the satsang (Dec 25) started with Prabodhanam at the residence of Smt. Jayanti and Sri Mayakoothan in Frisco, TX. The Parayanam of the 10th canto was led by Sri Narayananji. 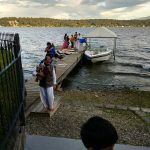 He also narrated the significance of Dasama Skandam, and led it into Krishna Jananam, followed by the various leelas of Lord Krishna. At the same time, Gopa Kuteeram was conducted for the kids. In the afternoon, Sri Swamiji’s kirtans were sung, led by Smt. Hema Kalyan and Smt. Veena Harihar. 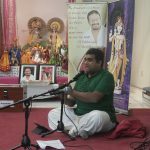 In the evening,at Fort Montersori School, the satsang started with chanting Mahamantra. Then Sri Narayananji discoursed on the greatness of Satsang citing the example of Bhishma from Srimad Bhagavatam. This was followed by Divya Nama Sankirtanam. Sri Sankarji and Sri Kalyanji led the Divya Nama. The day concluded with Dolotsav. The third day of the satsang was hosted by Smt. Boomaji and Sri Raghuji of Dallas. The day saw the continuation of the Dasama Skandam Parayanam. Sri Narayananji explained the Pancha Geetam, Rasa Leela, Kamsa Vadham, Uddhava Sandesham and Rukmini Kalyanam. Sri Ramanujamji from India also was teleconferenced. 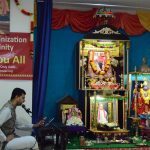 In his special address to the Dallas satsang, Sri Ramanujamji spoke on how the Satsang is at 3 levels, one leading to the other. 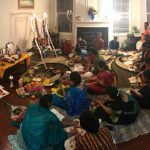 The GOD Utsav brought all the families of the Dallas Satsang together and renewed their energies to carry forward the Nama Sankirtan in the Dallas Metroplex. In all, about 70 devotees attended the 3-day program, making it a grand success.